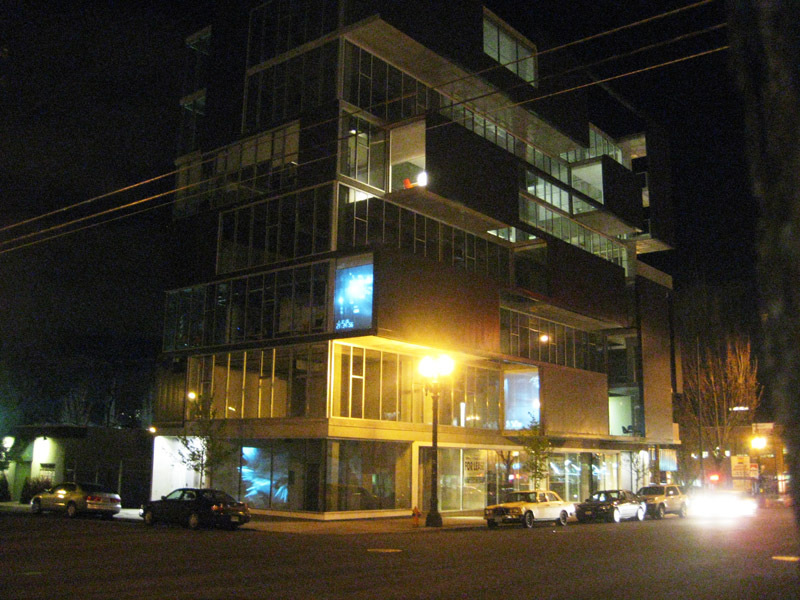 So, a while ago, Jon and Lauren at Works Partnership Architecture asked me to help out with a video installation in their building on 6th and east Burnside. 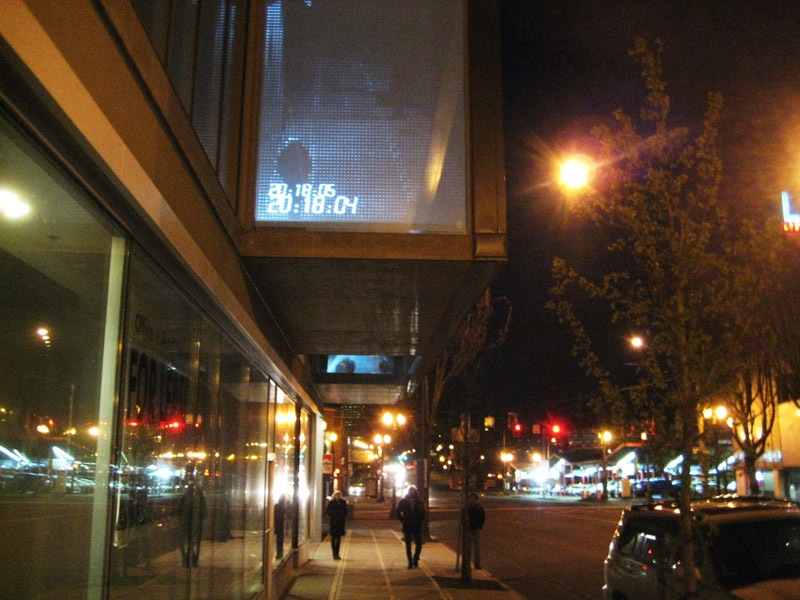 The basic idea was to project images from some old surveillance cameras into the windows of the building with time delay and time stamp. They brought me onto the project and I started building stuff in Processing. As the project progressed, and as I tried out and showed them new things I was doing with the video, the project changed from simple time delay to something cooler and more trippy. I also got to add automatic on-off switches for the projectors via their remote controls via arduino via computer. That doesn’t really add to the experience of it but it was fun to figure out. The project is up now through (I believe) the end of April. The computers turn the projectors on at 6pm, but it doesn’t become very visible till at least 7, and is much better viewed when it’s completely dark out. Go check it out! And if it’s not too late, go to the opening reception for it on 4/2/10. 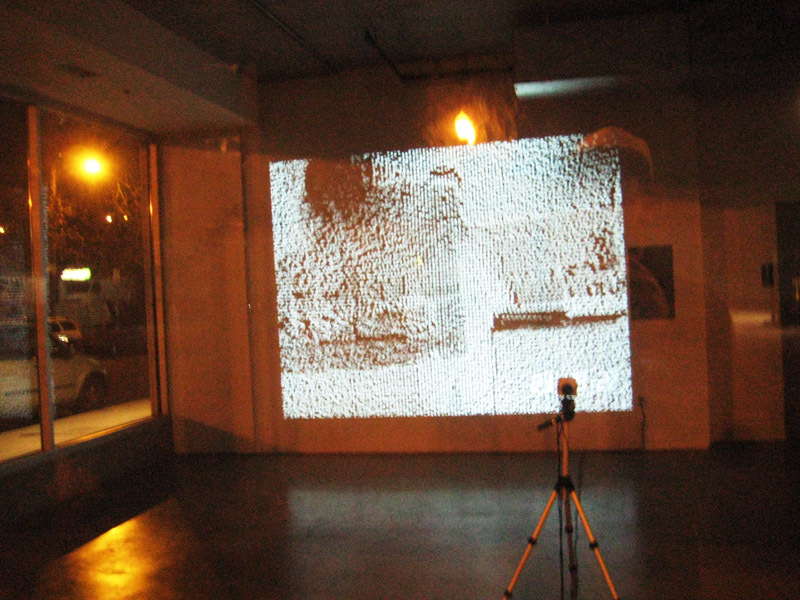 Here’s me taking a picture of it taking a picture of me- this is the only west-facing window with a projection in it. Here’s the building from across the street. You can see the projection inside on the first floor, and the east-facing projections on floors 2 and 3. 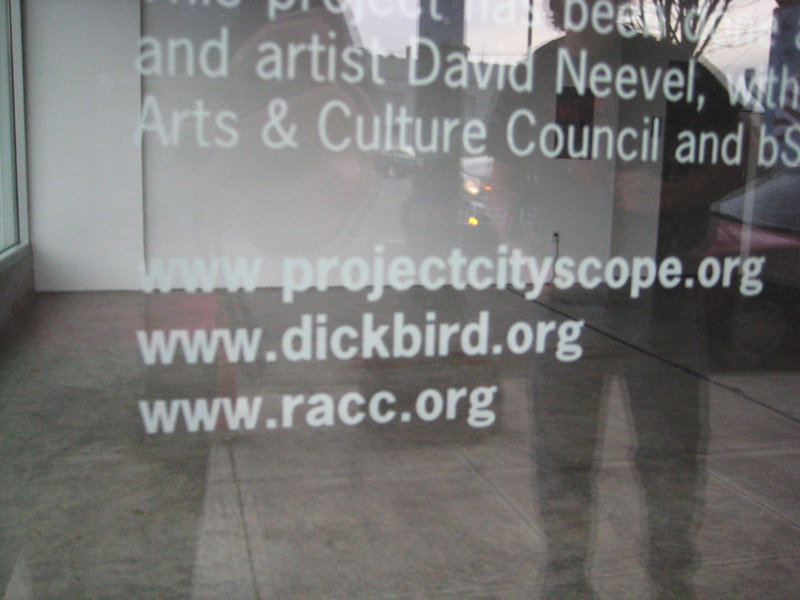 Here’s a picture of my name and the name of my website on the window. Yes! 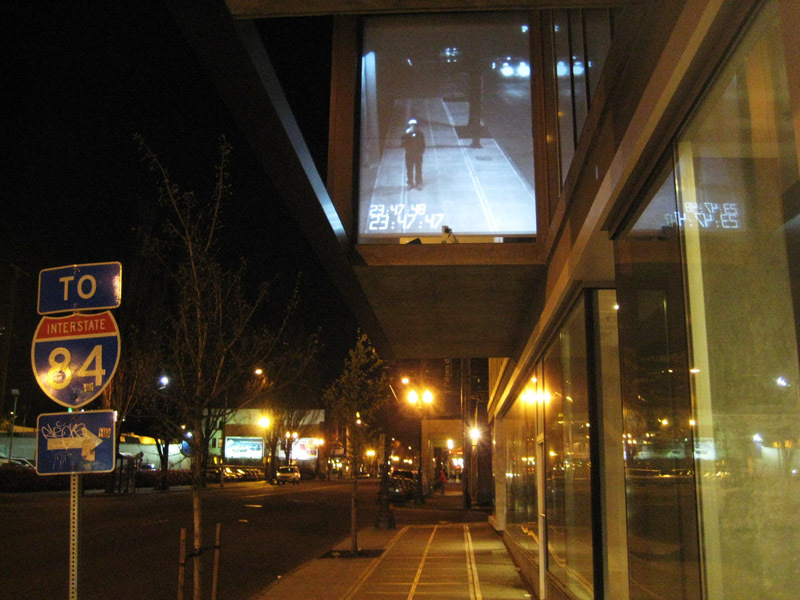 Here’s Kelly both on the sidewalk and in the projection. The projections (like this one) in which I messed with the image cycle through about 20 different ways of being messed with. Here’s the ground floor projection. This one is on a wall inside, rather than on a film on the window. You can just make out my shape standing in front of the camera. Here’s the downstairs one again, with a different effect on the video. It’s video, so hopefully it’s better in person, where you can see the pixels move and stuff. And see yourself in them. For anyone who’s interested, here is the code I used to manipulate the images. 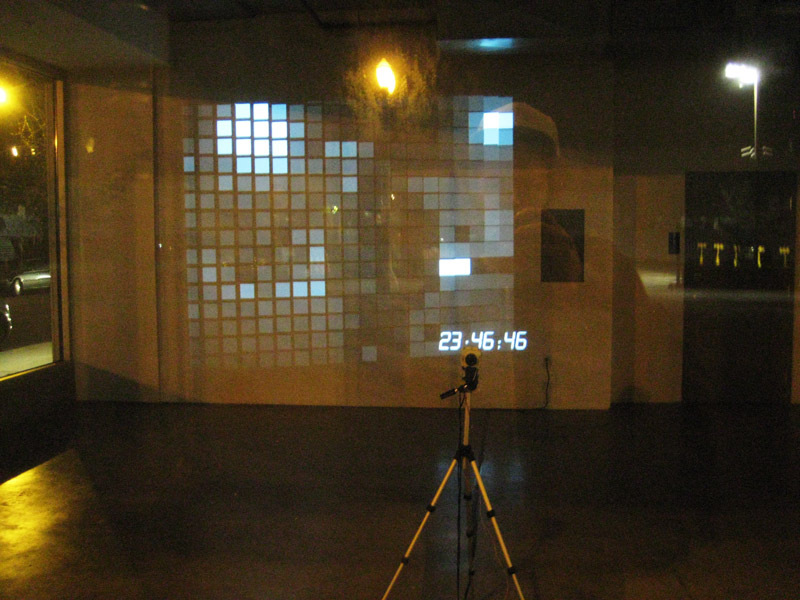 This is for the 2nd floor projection, so it also includes an unmanipulated but time-delayed image on the second screen.